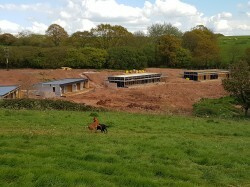 Since our last update there has been huge progress with the construction of our luxury lodges. Lodges 1 & 2 have been roofed and the first fix electrics and water are well underway. Larch cladding and decking is on order with the doors and windows due towards the end of May. All drainage will be complete next week so we can seed and plant up the ground down to the lake. Posted in Luxury Lodges by Seb Parker.